Often times I would come across videos (especially online) whose volume is way too low. I don't really know much about tweaking audio and stuff so here is a quick and easy way to temporarily amp up the volume. 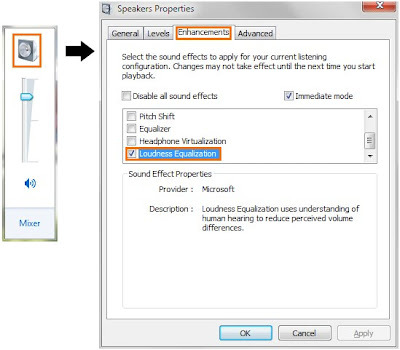 On your system tray, click on Volume control and click the Speaker icon. The Speaker Properties window will open. Go to the Enhancements tab. On the list of items with check boxes, look for and enable Loudness Equalization. Click on either Apply or OK. I mentioned 'temporarily' earlier cause this option ruins the listening experience. If the volume goes up like on movie scenes when the background music or effects get really loud - explosion and stuff - you won't be hearing the 'volume up'. Loudness equalization automatically lowers the volume such that it stays the same throughout. I only use this option when all else fails. 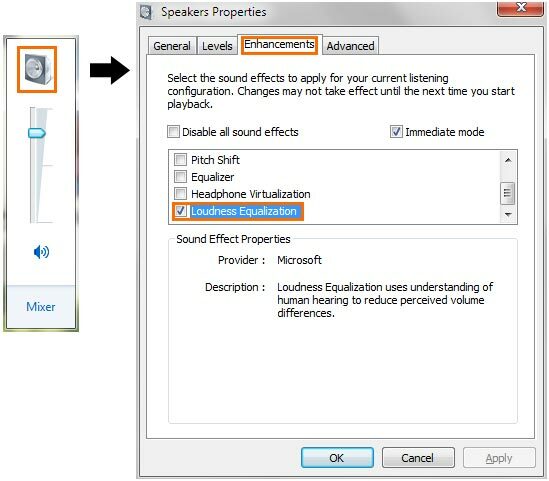 So, don't forget to disable it once you are done listening/watching the low volume music/video. Just an update: I recently made some changes to my system and now turning Loudness Equalization on/off disables (??) the audio of the video. So if this happens to you as well, just simply refresh the page (if it's in a webpage) or restart the video or toggle Loudness Equalization even before you start playing it. I'm not sure whether there is a setting to solve this issue so if I come across any fix, I'll update this post and let you know.